Этот семейный отель находится в 5 минутах ходьбы от Кафедрального собора Хероны. К услугам гостей терраса с небольшим плавательным бассейном в саду, а также номера с телевизором с плоским экраном, в которых можно воспользоваться бесплатным Wi-Fi. В числе удобств всех элегантных номеров климат-контроль, сейф и чайник. В апартаментах также обустроена мини-кухня. В современных ванных комнатах предоставляются купальные халаты, тапочки и профессиональный фен. Сотрудники стойки регистрации отеля Nord 1901 Superior помогут организовать услуги массажа и доставку еды и напитков в номер. Кроме того, они могут предоставить информацию о Хероне и близлежащем побережье Коста-Брава. Отель Nord 1901 Superior находится всего в 100 метрах от разноцветных домов на реке Оньяр. Прогулка от отеля до площади Независимости с многочисленными популярными ресторанами и кафе занимает 2 минуты. В отеле сервируется завтрак «шведский стол» в зале с видом на сад, а хорошую погоду завтрак накрывают в саду. There isn't anything we disliked about the hotel or our stay there! Wonderful hotel and location. Highly recommended. The service and the management people. The noise. other hotel guests were very noisy and the sound traveled through the corridors and windows. Great location for the old quarter of Girona. Nice rooms and very comfy bed. Quiet area. Very helpful staff. Best wine and olive oil shop nearby. Just a short walk to a good variety of restaurants, cafe's and tapas bars. Lot's of very nice shops too. The hotel is tastefully decorated. The staff are knowledgeable and helpful. Location was excellent in a pedestrianized cobbled street which allowed taxi access. Located amongst shops, bars and restaurants but quiet. Modern rooms with comfortable beds and good bathrooms. Very helpful and polite staff. Only a 15 minute walk from the railway station or less than 6 Euros by taxi. We were upgraded to a superior room which is very large with cooking facilities but it was on the 4th Floor with the lift only going to the 3rd floor. If you have limited mobility it would be worth checking this out prior to booking. Note that the hotel staff offered to help us with our luggage. I will stay at the Nord 1901 when I stay in Girona next time. Excellent hotel the staff were all very helpfull, nothing was to much trouble. I would recommend this hotel to everybody . Wifi kept clicking out and you had to log on again, very frustrating. Our room had a window with a view to downcast - it's a nightmare. When I was choosing a room, it was not enough bold mentioned and appear when I already choose a room in detailed description - which not a lot of people usually read. We had a suite on the 4th floor, had absolutely everything you need including the kitchen sink! Very stylish and comfortable. The hotel is in the very heart of the shopping areas for little boutiques, bars, restaurants and cafes. Excellent hotel with secure car parking just around the corner 21 euros for 24 hrs. If your just flying there it would make a perfect weekend getaway. The room was just a box. Charmless and unattractive. You would not want to spend any waking time there... The hotel was completely un-signposted and thus took us about 45 minutes to locate. The bath was too short, and only a buffet breakfast was served which meant to have a simple breakfast we went out to a cafeteria and paid one quarter of the hotel price. Wonderful staff, great location, clean and modern decor. Apartment is big with everything needed to cook. BBC and CNN in English. Noise from outside or nearby restaurant/club until early hours in the morning. Wifi was very slow. Slight musty smell in the bathroom. Breakfast was un inspiring. poor selection of cereals - hot food had been cooked for some time. Very comfortable room. Pleasant and helpful reception. The only window in the room looked out upon a wall. Everything. I was very pleasantly surprised. Great location, nice interier (boutique hotel), lovely staff. Everything , helpful friendly, very well designed , stylish, comfortable, good location, beds comfortable, in center but not noisy, pool a real plus, tast breakfast, easy check in and out, very elegant. Everything. Very nice design/boutique hotel. Perfect location for Girona. Friendly staff. Very good facilities. Nothing. I liked everything about this hotel. Luxury at a reasonable rate. Very friendly and helpful staff. Nothing too much trouble. The hotel was very conveniently situated for access to all parts of Girona. Staff were friendly and helpful but discreet and not intrusive. The room was comfortable and well equipped - there was good attention to detail. We would have liked a wider choice at breakfast which cost 12 euros. However what was available was good quality. Difficult to approach by car; need to highlight box with phone connection to lower pillar in middle of narrow street. Great room and great, swimming pool. A very comfortable stay. Nice location. Check in delayed 30 mins, room was not ready. Extremely helpful and polite staff who spoke excellent English. Wonderful central location. Not very easy access with car and car parking is expensive. Excellent location. Very friendly staff. The bed was excellent. Internet working very well. Spacious comfortable room and ensuite but see didn't like 1. Friendly and helpful staff. Central but quiet location, good for sightseeing on foot. Proximity of wide choice of restaurants. 1 Washbasin plug broken and not noticed by staff until brought to their attention, then repaired quickly. 2 Room1.2 window only looked on to a central lightwell. there wasn't much ventilation in our room; and the windows opened to a roof-ed internal courtyard so it got very stuffy at night without Air-Con. Perfect location, easy access to the old town of Girona. Very good service. Spacious bedroom had only one easy chair and one desk chair. Another easy chair and small table would have fitted in easily. Nice design, friendly staff and calm atmosphere. Excellent with pool and relaxing garden. Can't comment on the rooms as was in different hotel but what I did experience of the hotel I couldn't fault!! Perfect location, friendly staff, clean and quiet hotel. Parking your car is a little way away..
Clean, modern, quiet and comfortable. Spacious room and a fabulous shower. Pool area was a little oasis in the city. The hotel was in an excellent location in the heart of Girona close to lovely restaurants and bars. The room was of a very high standard. The staff were exceptionally friendly and helpful. Excellent service from the good people at the front desk. Excellent locatin pleasant room. The service of the staff overall was very welcoming and attentive. Rooms were quiet, modern and spacious. Friendly helpful staff. An upgrade to a suite was a lovely surprise. The pool and patio area were a pleasant place to relax at the end of the day. Central location but reasonably quiet. A gem of a hotel- the calm, tranquil reception area was very pleasant. The pool was very welcome and extremely refreshing after a long lunch at El Cellar de can Roca. Our room didn't disappoint either- it was very spacious, quiet, stylish and comfortable. Staff was very friendly and helpful. The location is perfect, right off Placa D'Independencia for great eating on the square. Even though the hotel does not have on-site parking they took care of getting the car to and from the garage for us. Great service, beautiful pool area.We loved it. Very nice size apartment for family with two children under ten years. Really nice hotel with a fine and tasty breakfast. Friendly staff, near shopping and restaurants. And a little poolarea to cool off on varm days. Clean comfortable rooms with contemporary design only steps away from old and new city.Quiet boutique type hotel. Great choice of gelaterias, bakerys and good restaurants nearby . 10 min walk to both gourmet and grocery store. Free parking nearby. A little difficult to find (no indications), small one way side street double doors leading to rooms can be very noisy in spite of efforts to close them gently; notice should be posted by hotel to remind guests to be respectful of neighbours. Excellent location, lovely helpful staff, just a great hotel. centrally located in Girona with easy acces to the old and the new town.Modern facilities in a quiet setting (boutique type hotel). Close to artisan pastry shops, gelaterias, specialty food shops and restaurants. Free parking nearby. Perfectly located. Beautiful suite overlooking the pool and garden. Very spacious and well-appointed. Nice, helpful staff. The hotel is a beautiful, comfortable hotel and the staff very friendly. The location is superb, a short walk into the old town and great restaurants. Good shopping all around the hotel. The breakfast was very nice. We had a deluxe apartment which could easily hold a family in great comfort with two bedrooms, kitchen and sizable living room area. It's an easy place to use as a base camp for day trips to the coast or other areas in the Costa Brava. We were directed to close by free parking by the hotel staff. They also had a close by secure parking option for a fee. We would definitely return to this hotel for future trips. Nothing we didn't like. The hotel was great. 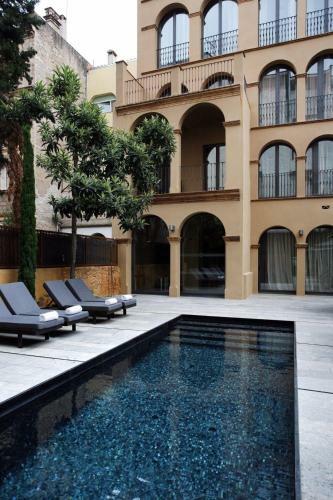 Huge lovely 2 bedroom apartment (#2.4), very quiet on the inner courtyard overlooking the pool. Super comfortable bed. Terrific location - a few minutes walk to the old town, a couple of blocks from the free parking at Devesa. Great staff! Nothing- it was a fantastic 4 night stay. The hotel is perfectly placed near the center of Girona, is a small-quiet hotel with spacious rooms and a beautiful small pool with bar service until 23h. The breakfast is amazing with fresh orange juice made at the moment and a selection of salty and sweet food. We found this Hotel to be very well located in the heart of Girona where much could be accessed on foot. The staff were extremely helpful and happy to store our bags on check-out. It is a delightful Hotel with very spacious rooms and bathroom. Very clean and certainly well priced. We would always prefer to stay there on our return. Highly recommend. Liked everything. Nothing bad to report. The location is a bit hard to find if u are driving yourself. Wonderful location. Half a block from Independence Plaza but quiet & restful. Modern comfortable room. Lovely dining area with view of courtyard. Excellent breakfast. Good value. Helpful desk. No directions to parking on website and it took us 45 minutes to find the public garage. Inside room was very dark. Next time would ask for a room facing the back courtyard. Very good location, nice design and very friendly staff. No parking space. Rented a car for a few days and one evening spent almost an hour trying to find a space to park it. The wow factor on entering the foyer with the pool /waterfall in the background.The understated ambience of the hotel. The large spacious clean room. Well stocked bar and kitchen facilities. Friendly staff. I am at a loss to think of anything. 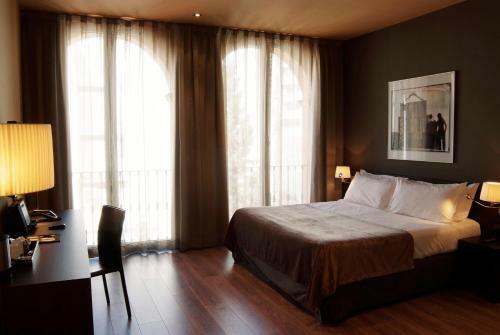 Ultra modern rooms in a renovated hotel close to heart of historic Gerona. Very quiet location on a pedestrian only street. Very quick and easy access to all of Gerona's historic sights. Had to park 2 blocks away in a garage costing a stiff 21 Euros/night. Thankfully it wasn't raining since we had to roll our bags the 2 blocks to and from the hotel. Hotel has a lean staff, so we did the bag hauling on our own. Excellent staff - very friendly and helpful, good breakfast buffet, lovely garden area and good quality decor etc. Also very good location for access to shops, restaurants and activities. Wish we'd got a room with proper windows, rather than overlooking a light well. Gorgeous room: frendly, english speaking reception: beautiful patio garden with swimming pool (unfortunately weather not condusive to use of pool): location perfect, in the heart of the historic old town. Staff could not of been more helpful. Internet service was terrible, unfortunately. The rooms and staff were great.Location superb.